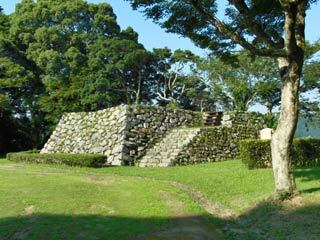 Futamata Castle (二俣城) is the ruins of the mountain castle located on Tenryu, Hamamatsu. Because it was located in the middle of Totoumi and on Tenryu river, Takeda Shingen and Tokugawa Ieyasu fought many times for its supremacy. It has great view of Tenryu River. Futamata Castle is mountain castle built in early 16th century. Because it was located in the middle of Totoumi and on Tenryu river, Takeda Shingen and Tokugawa Ieyasu fought many times for its supremacy. In 1569, after the fall of Imagawa clan, Ieyasu took over Futamata Castle, and it became the most important castle to protect Hamamatsu Castle. However, in 1572, Takeda Shingen moved his army head to Kyoto, and Takeda Katsuyori, the son of Shingen defeated Futamata Castle. This fall also coursed the battle of Mikatagahara which Ieyasu lost seriously by Takeda Shingen. This march of Shingen was ended by the death of Shingen, but Ieyasu had never a chance to get it back. In 1573, Takatenjin Castle which was the other important castle of Ieyasu, was fallen. This year was one of the toughest year in the history of Ieyasu. But, after the great victory of the battle of Nagashino, Ieyasu finally back of Takeda armies from both castles. Futamata Castle was also where Nobuyasu, the son of Ieyasu did seppuku, harakiri in 1579. Currently, it is small park is the ruins of Tensh base and stone walls.